Of course. A real "Well DUUUH" moment. Information on Wikipedia is put up (and edited) by all sorts of people. Believers, Atheists, people from other religions, Agnostics, etc. Consequently, short of some miraculous intervention by God, there will always falsehoods mixed in with the truths. Unless knowledgeable, studied believers review and edit every single word, there will always be a mixture of error. Hence the wisdom of refusing to accept it as truth, and checking references and sources. One other thought (? ): I always refuse to accept any further evidence as to the truth of the Biblical account of how things were. The creation, the sun standing still, etc. 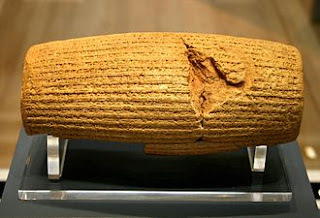 Even to discoveries of ancient treasures such as the Dead Sea Scrolls, the Cyrus thing, anything. I have heard stories of folks who said that God placed phony geological 'evidence' on the Earth to test the faith of believers, and that logic seems also to be a way of not accepting such 'evidence'. My thought is that God is not in competition with His Creation; that He is the Creator of all that is seen and unseen 'ex nihilo'. Bob, do you believe every word of the Bible is perfect? I stand on Jesus’ words ‘Truth will set you free’. I believe everyone will agree Bible Writers did not go into a trance and God moved their minds and hands to write Scriptures. Jesus did not lie because he believed what he said, but learned later. Based on this Scripture, many people believe you must be baptized to be saved..
Would Peter have written what he did if he had seen Gentiles receive the Holy Spirit BEFORE they were baptized in (Acts 10:44)? Rex: If I allow this discovery to affect .. even affirmatively .. my opinion of, or reliance on, the truth of Scripture, then to refuse to acknowledge "scientific evidence" which refutes the Bible would be hypocritical of me. So I do not. God has proven scripture. As to the account of creation, any evidence or opinions I hold must come from scripture. As it happens, I've noted that God referred to every "morning and evening" as a day. We conclude that a day was 24 hours when the sun, moon, and stars were created, and if He'd called something else a "day" in the previous verses, that would constitute confusion. And God does't do that. Yes, the words in the original are the same. Scripture proves scripture. Nothing else does. Further "discoveries" don't. God handled that task quite well. Science can no more prove or disprove scripture than a traffic court can affirm or overturn a Supreme Court decision. Psalm 90:4 and 2 Peter 3:8 "With the Lord, a single day is like a thousand years" (or a million or more ?). Could this help us to understand the creation story ? For me, there can be no doubt the God is the Great Creator and sustainer of the universe. But how He did this I do not know, nor do I need to know. This can be left to the scientists to try to explain, if they ever can. The Bible uses picture language in many instances to convey absolute truth, which is far better than using the medium of ever changing scientific explanations. I don't think a literal understanding of a seven day creation was intended, any more than was the statement in Joshua 10:13 that the sun stopped in the middle of the sky and didn't move but delayed going down for about a full day. It was figurative language yet we know and believe exactly what was meant. There is a systemic effort of 'skeptics' to infiltrate and override anything written on Wikipedia. They have an extremely bad reputation, are extremely biased, and consider themselves not only atheist, but decidedly anti-Christian. Wikipedia periodically kicks entire groups of them out as contributors, but they keep returning, under different identities. They also have a pattern of systemic harassment and bullying on different mainstream sites, where someone who is Christian might comment. Their harassment is so pervasive, I've just about quit commenting about anything Christian. It's not worth it. Thank you for replying. I’ve always admired your wisdom. I see you have your mind made up and NOTHING can change it. In my opinion that trait for anyone is not what God intended for man. I believe God gave us the Holy Spirit to teach us and none of us has learned so much that we don’t need Him anymore. You did not answer if you believed every word in the Bible was true with a ‘yes’ or ‘no’, but said, “God has proven scripture”, “Scripture proves scripture”, and “God handled that task quite well”. Do you agree “God’s ways are not man’s ways”? For instance ‘man’ would not have had the lineage of Jesus being a prostitute, an adulator, and a murderer. If Noah’s ark was found and it fit the Bible’s description in every detail and even if the waste of each individual animal was identified, would you believe it? At present, I’m refuting a paper claiming the KJ is the only English Bible that is perfect. How were they born of the giant when one was his brother? Other translations omit “brother” in verse 19. It’s good you reminded us that a “single day is like a thousand years’. How old did Eve look when she was one minute old? I believe when God made a rock, He could make it look like a million years old if He wanted to. The Bible is God's word. Nothing man can do can either prove or disprove what it says. Any difficulty I have coming to grips with the absolute truth of scripture is do to my flawed, sinful, finite mind. At creation, God said He did it a day at a time. I have no desire to speculate on whether He meant something else by that. Why would I want to? I accept them as a day, the same way I accept today as a day. 24 hours. I credit the doubt as to what He said as meaning the same thing we mean today, by saying "day", to the same source that caused Eve to doubt the truth of what God said to Adam. As to the words I use to describe scripture, attach whatever handle you want to, to them. It's all slanted, even the academic versions of texts. Wikipedia is only more blatant in its tendentiousness. SJ, Bob and Gary - Your comments are very revealing. Thanks for the input about Wiki.